Accessing general information concerning the impact of pesticides on human health. The glossary provided here defines terms that are found within this SHPF kit. Guidelines produced under the International Code of Conduct on the Distribution and Use of Pesticides. 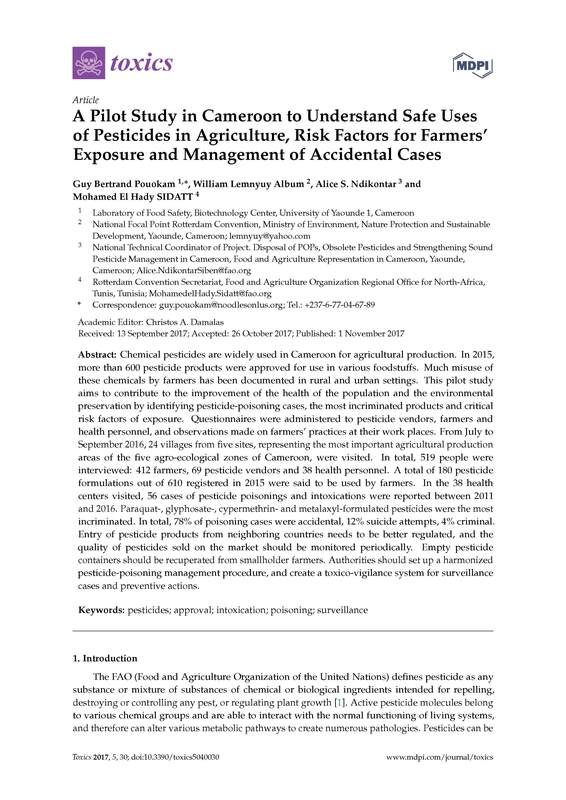 The purpose of this guideline is to assist governments in taking the first step in the development and establishment of a basic reporting program for pesticide incidents, which have been defined here as situations where pesticide exposure has resulted in a health or environmental problem. The information collected can be used to minimize adverse impacts on human health and the environment through appropriate pesticide risk reduction measures. Information on incidents should be provided to pesticide regulatory authorities as a means of strengthening national decision making on pesticides. This comprehensive manual provides information on how to develop and maintain surveillance programs for acute and sub-acute health effects from pesticide exposure. It was developed for U.S. State health departments with planned or established pesticide poisoning surveillance programs. NIOSH is the U.S. federal agency responsible for conducting research and making recommendations for the prevention of work-related injury and illness. A tool developed by the Integrated Pest Management Programme for Asia (FAO/IPM) to prepare simple means for farmers to self-report signs and symptoms of pesticide poisoning after each spray session. Trained community members collect the forms weekly. They then summarize, graph, and present back to the participating community the data for discussion on a monthly basis. A local physician attends each of these meetings and adds any pesticide poisoning cases seen in the local clinic from the proceeding the month. This pilot study aims to contribute to the improvement of the health of the population and the environmental preservation by identifying pesticide-poisoning cases, the most incriminated products and critical risk factors of exposure. A pilot study sponsored by the Secretariat of the Rotterdam Convention. The report provides details of the methodology used, including copies of survey tools, as well as an analysis of the results of surveys conducted among various stakeholders including farmers, health officers and retailers. Standard incident report forms for human health incidents and environmental incidents involving hazardous pesticide formulations have been developed to assist with the reporting of these incidents. Pesticides Exposure Record (PER) – a standard format for collecting data on human exposures to pesticides, developed by WHO. This is a survey tool based on self-surveillance system, controlling pesticide accumulation at community level in Lake Eyasi Basin, Keratu District, Tanzania. A season-long assessment of acute pesticide poisoning among farmers was conducted in three villages in India. The study documented the serious consequences of pesticide use for the health of farmers, particularly women field helpers. This results template is designed to capture important lessons learned from health surveillance projects. Its purpose is to generate a body of information from different projects that can be used to encourage and facilitate other countries to initiate their own surveillance programmes in relation to pesticide use. It requests summary information in a standardised format for easy comparison. The Toolkit provides users with guidance to acquire and use the information needed to assess chemical hazards, exposures and the corresponding health risks. It contains road maps for conducting a human health risk assessment, identifies information that must be gathered to complete an assessment and lists electronic links to international resources from which the user can obtain the necessary information and methodologies. The Toolkit is applicable to pesticides and includes a pesticide case study. This short leaflet identifies the reasons for monitoring health impacts of pesticides and briefly outlines steps towards developing a monitoring programme. Pesticide poisoning is a serious health problem that disproportionately affects infants and children. The purpose of this document is to provide you with information for advocacy and action directed at reducing pesticide poisoning and addressing its effects on children and women. The report presents and analyses the results of 21 surveys in 13 countries in Asia, Africa and South America. A sample survey tool is included. Evidence of pesticide impacts can help governments to improve national pesticide regulation and help shape international instruments and policies for pesticide control. Community monitoring is a locally-based process of documenting the effects of pesticides. Through the process of documenting pesticide exposure and impacts, communities become more aware of the risks, a first step toward adopting more ecological and sustainable agricultural practices and reducing their dependence on pesticides. International Chemical Safety Cards (ICSCs) provide essential health and safety information on chemicals to promote their safe use. They are used at the “shop floor” level by workers and employers in a range of settings including in agriculture. A posters designed to raise awareness on the effects of pesticides and on the hazards posed by empty pesticide containers. A WHO/UNEP resource tool intended to assist those involved in the management of pesticides and with diagnosis and treatment of pesticide poisoning in formulated training courses, adapted to the needs of specific target groups. Additional resources on other aspects of the Rotterdam Convention are available from http://www.pic.int. This document has been developed to provide comprehensive guidance to Designated National Authorities (DNAs) on the rights and obligations of Parties under the Convention. It is also a comprehensive source of information for a wide audience on the Convention and its operational elements. A list of institutions and organisations that are in some way involved in looking at the impacts of pesticides on health, along with a brief description of the organisation and its objectives, the resources they make available and web links. Further reading on health monitoring in relation to pesticide poisoning.